Kent's "Hooligan Libertarian" Blog: An extraordinarily evil "citizen"
What information can you glean about the people who publish it? First, it is published by "Focus on the Family". I consider this group to be a political cult within Christianity, due to decades of familiarity with them, but that's obviously just my opinion. The "political means" is the unethical way of interacting with others-- the means used by muggers, politicians, rapists, cops, and other bad guys-- as opposed to the only other option for interacting with others: the economic means. If you can't get what you want by mutual consent, where both participants gain, you force them-- at gunpoint, if that's what it takes-- to do what you want, with "laws" and enforcer gangs, so that there's a winner and a loser. Being political also goes against just about everything taught by Jesus, but it would be inconsiderate to point this out to them. "Citizen" is also a term used to indicate slave status under the State. Strange position for this "religious" group to take and promote, since this puts the State in the place of God. It is interesting to me that a "religious" group would embrace unethical behavior so completely that they would name their publication "citizen". This is why I differentiate between "moral" and "ethical". They are behaving "morally" according to the "principles" of their group, just like the suicide bombers of other religions are doing, while being completely unethical, as illustrated by the cover story. And, let's look at that cover story. They obviously believe that "vices" should be crimes, and should be enforced as all "laws" ultimately are. They are claiming it is a "bad idea" to stop killing people and destroying their lives with "laws" based on lies. Lies about a plant. Lies about who should have the power to control each person's body. They believe a state refusing to stop molesting people is a good thing. Sick! What if someone turned the tables on them and outlawed something they value? Their twisted position in support of prohibition makes me wonder what their position on ending (other forms of) slavery would have been. Actually, I don't really wonder- I think it's pretty clear. They would have been celebrating any state which refused to get rid of "laws" legalizing chattel slavery. They would want slaves to obey the "law"-- to be "good", obedient slaves-- and be punished or killed if they didn't. They would want fugitive slave "laws" enforced, and would support the agents who enforced those "laws". If they object and claim that they wouldn't support that position with regard to slavery, then why the inconsistency? Why the hypocrisy? 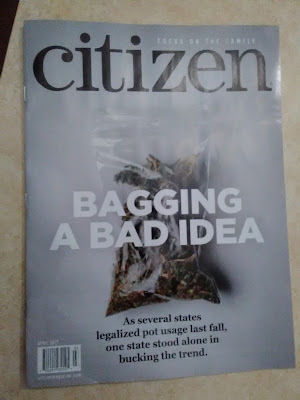 The real "bad idea" here is giving people the political opportunity to meddle in the lives of others, and punish them when they don't cooperate with their own violation. No good group would condone such evil. It might be good to remind "citizen" that every human has the right to defend himself, using whatever means prove necessary, against invading armed criminals, whether they're freelance or are enforcers of illegitimate government edicts, wearing government costumes. This magazine's prescription for a good society leads directly to dead government thugs (and, unfortunately, to dead innocents as well).